Parrots, a vast group of colorful, intelligent companions that we share our world with. Macaws are our specialty, with Amazons, Cockatoos and Conures rounding out the menagerie of our South American birds. We have published multiple informative articles regarding care, housing, transportation, breeding, incubation and identification of Ara and Anodorhynchus species. Worldwide breeding exchanges of Macaws, Cockatoos, Amazons and Conures are encouraged. Through this web site we intend to provide our published articles to benefit aviculture throughout the world. 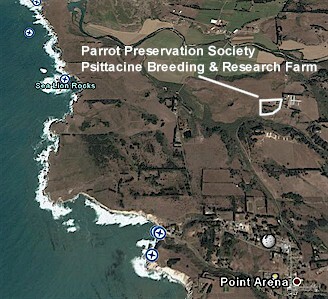 Endowments benefiting species preservation are welcomed, both of birds and donations to the Parrot Preservation Society. We're looking for caretakers and everyday volunteers in Parrotdice.